Claremont, Calif. (July 13, 2016)—Pitzer College recent graduate Marie Fleming ’16 will serve with the Peace Corps as an agriculture extension agent in Madagascar. For the next two years, she will work with community members on issues related to sustainable agriculture and food security, bolstering local harvests while reducing destruction of forest buffer zones. Fleming is following family footsteps into the Peace Corps. Her father joined the Peace Corps in the 1970s and taught English in the Democratic Republic of Congo, where he met Fleming’s mother. Growing up, Fleming says international aid work was a frequent topic of conversation around her family’s dinner table. “I heard many stories about the challenges and the rewards of working abroad, learning the language, navigating the vastly different cultural norms, making life-long friends and becoming an active community member,” Fleming said. Fleming studied abroad on the Pitzer in Botswana program. As a research intern with the Okavango Research Institute in Botswana in 2014, she conducted fieldwork to explore conflict between humans and wildlife in the region. She says her experience in Pitzer in Botswana encouraged her to apply to the Peace Corps. “During my time at Pitzer, I determined that I too wanted an experience like my father’s and to continue my post-Botswana learning,” Fleming said. Fleming majored in environmental analysis and minored in Africana studies at Pitzer College. She taught and mentored elementary school students in Claremont as part of the Leadership in Environmental Education Partnership known as LEEP. Last year, she helped reforestation efforts in Nicaragua with the nonprofit Lone Tree Institute. 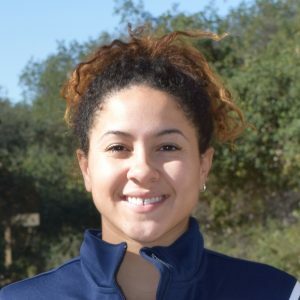 Fleming also played on the Pomona-Pitzer Women’s Tennis team for four years and served as team captain during her final two years at Pitzer. The Peace Corps is a service opportunity for motivated changemakers to immerse themselves in a community abroad. President John F. Kennedy signed an executive order establishing the Peace Corps in 1961. In the 55 years since, Peace Corps volunteers have served in 140 countries, working alongside community leaders to solve critical challenges.